Starting off the year with another hot take on Hot Cheetos, a California restaurant created an item that'll entice anyone in search of a spicy and hearty poke meal altogether. The Low Key Poke Joint, in Garden Grove, CA, created a Hot Cheetos Poke Burrito t0 incorporate the fiery corned puffed snack into their menu in an innovative way. Utilizing a build-your-own-poke concept, the restaurant gives you a large variety of ways to craft a poke/sushi "burrito" or bowl. 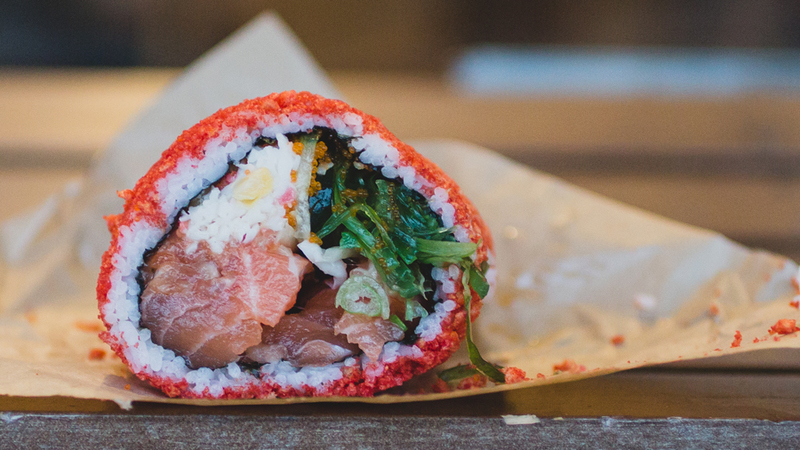 One of the more popular, social media-friendly options includes a Hot Cheetos wrap for sushi burritos. The burrito features a fish protein of your choice, crab meat, masago, onions, and tons of other sides and toppings. The odor of Hot Cheetos and fish was off-putting at first, and definitely affected my outlook on how it'd taste. However, a couple bites into the thing and I was not mad at all. It was a pleasant surprise, for sure. Even though the spiciness from the Hot Cheetos wasn't too evident, the crunch factor it provided was great. You can find the Hot Cheetos poke burrito at NOODS NOODS NOODS, presented by Cup Noodles, which will be held on Jan. 14. If you're a fan of noodles, Asian fusion, and spending an afternoon taking gratuitous pictures of innovative dishes, you can get your tickets to NOODS here. Options for the festival includes Marketplace (buy-as-you-go) or VIP (all-you-can-consume). To anyone attending, make sure to send us your NOODS.